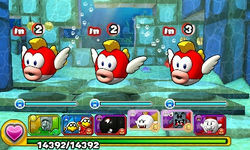 World 1-4 is the fourth course of World 1 in Puzzle & Dragons: Super Mario Bros. Edition. 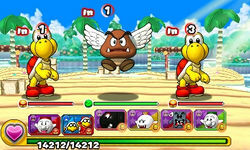 It is a beach level with enemies consisting of Koopa Troopas, Paragoombas, and Cheep Cheeps. Clearing this course once unlocks Yellow Toad as a Helper. This level starts with two battles, after which the player reaches a branching path with a sign on the left and a yellow Warp Pipe on the right. 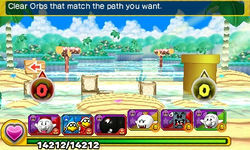 The left path requires the player to clear more Fire Orbs than other Orb types, and the yellow Warp Pipe on the right requires more Light Orbs to be cleared. 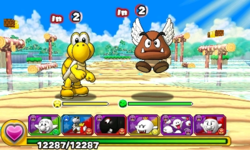 Taking the normal path on the left, the player faces another battle before the boss fight at the end with two Red Koopa Troopas and a Paragoomba. When playing this course for the first time, the Red Koopa Troopa on the right during the boss battle drops a Star Coin upon defeat. To take the yellow Warp Pipe on the right, the player needs to bring an ally that can create Light Orbs as the course itself does not provide them. Taking the Warp Pipe, the player enters an underwater section and faces a battle with Cheeps Cheeps before the boss battle with three of them. Clearing the course with this path unlocks World 1-5. The player has only Fire, Water, Wood, and Heart Orbs on the Orb field for this course. The boss battle of World 1-4. Red Koopa Troopa (Boss battle) ? 611 -- 32 2 ? ? Paragoomba (Boss battle) ? 820 1230 (Tackle) 16 2 ? ? When playing this course for the first time, the player is rewarded with 33 XP when facing a Paragoomba and a Cheep Cheep on the second battle. In any subsequent visits, the player earns the standard 30 XP instead. When playing this course for the first time, the player is rewarded 228 XP and 4 Coins. In any subsequent visits, the player earns 228 XP and 6 Coins instead. ★World 1-4 is a difficult version of World 1-4 from ★World 1, with Light and Dark Orbs appearing on the Orb field, while Wood Orbs do not. As such, the Warp Pipe on the right is now green and thus requires the player to bring an ally that can create Wood Orbs and clear more of those than Fire Orbs to take that path. Clearing the course with this path unlocks ★World 1-5. Red Koopa Troopa (Boss battle) ? 4650 -- 318 2 ? ? Paragoomba (Boss battle) ? 5073 7610 (Tackle) 183 2 ? ? The alternative boss battle of World 1-4. This page was last edited on November 24, 2017, at 23:24.